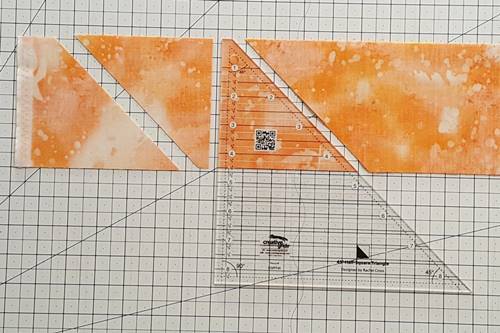 A half square triangle ruler is very handy when making lots of half square triangles. 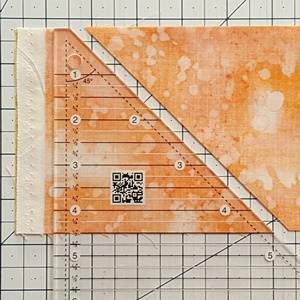 See how to use two different types of HST rulers. Style 1 HST ruler has a blunt tip at the top. 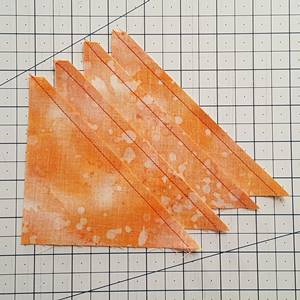 This accounts for the offsetting 1/4 inch tips that you usually need when sewing two triangles together. 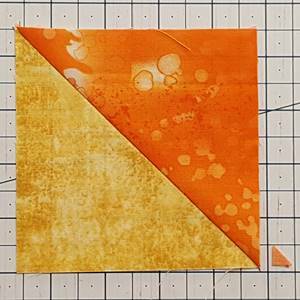 To use most HST rulers, cut 2 strips of fabric 1/2 inch larger than the finished size of your HST. Step 1 Cut 2 fabric strips to that measurement (Here, my HSTs need to finish at 4 inches so I cut my strips 4 ½ inches wide). 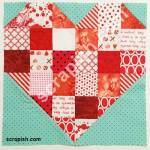 Place the fabric strips right sides together on a cutting mat. 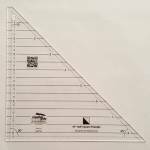 Locate the corresponding measurement line on your HST ruler and align it along the bottom edge of the fabric strips. The top edge (blunt edge) of your HST ruler should align with the top edges of the fabric strips. Place the numbered straight side of the ruler ¼ inch or so to the right of the selvage edges. 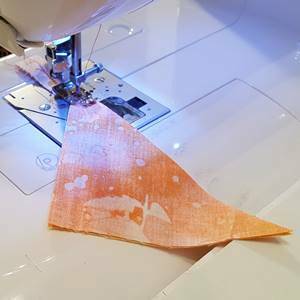 Using a rotary cutter, cut the fabric strips along the 45 degree angle side of the HST ruler. Step 2 Rotate the ruler clockwise 180 degrees (so blunt tip points south). 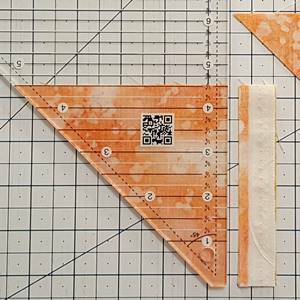 Align the blunt tip with the bottom of the fabric strips and the 45 degree angle side with the previously cut 45 degree edge. Using a rotary cutter, cut the fabric strips along the 90 degree angle (straight) side of the HST ruler. Step 3 Rotate the ruler clockwise 180 degrees (so blunt tip points north). Align the top of the ruler with the top of the fabric strips. Align the straight side of the ruler with the straight edges of the fabric. Step 4 Repeat Steps 2 and 3 until you've cut the required number of half square triangles or the number allowed by the length of the strips. Step 5 Now for the selvage edge half square triangle... Rotate it and the ruler clockwise 180 degrees. 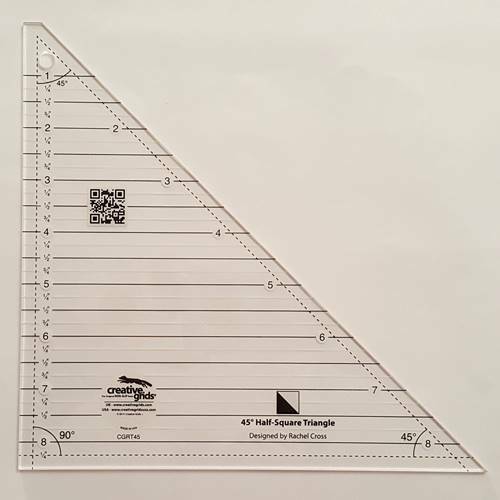 Align the 45 degree side of the ruler with the 45 degree angle side of the fabric. The top (blunt end) of the ruler should align with the bottom edge (what used to be the top) of the fabric strips. 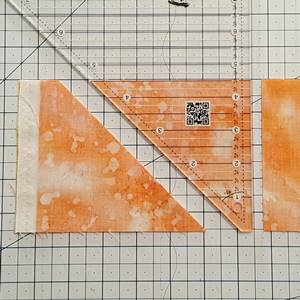 The cut size of the fabric strip (4 1/2 inches) and the corresponding measurement line on the ruler should line up with one another. Cut the fabric strips along the straight edge of the ruler, removing the selvage edges. 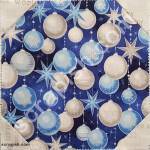 stitch each HST with a 1/4 inch seam. So easy to stitch! Step 7 Open the half square triangles with the right side of the fabric up. Press the seams as directed or towards the darker fabric. Clip the one dog ear off the HST. 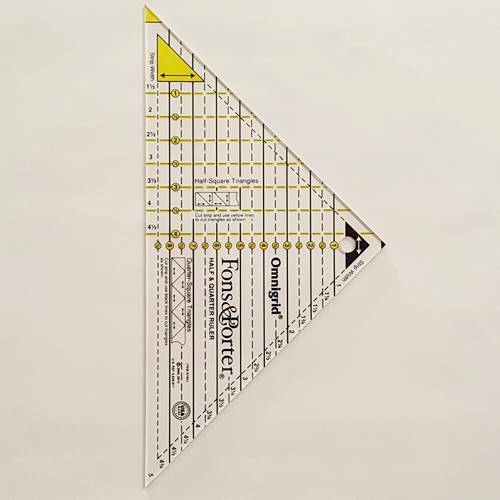 Style 2 HST ruler has a full triangular tip. It also has a line and/or coloring marking the HST tip. These show where to place the ruler on the fabric edge. A number of these rulers do double duty. They are used to cut quarter square triangles as well. Here, I will only discuss the use of this ruler for cutting half square triangles. 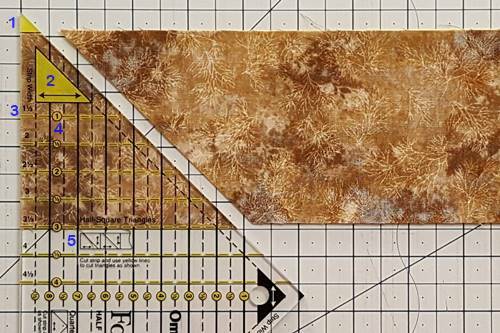 Here's how you line up ruler Style 2 to cut the strips of fabric. The the bottom of the colored tip (or the line marking the tip) is aligned with the top edge of the fabric. The remaining instructions are the same as noted above for ruler Style 1.